How are you coming along with your suprise pop-up cards from last Tuesday's Tutorial? I'd like to encourage anyone who is feeling too chicken to give it a go! This is such a fun card! I also promised Alyssa another shout-out for Miss Art's Papercrafting School where they are continuing their OWH card-collecting efforts with a new card tutorial every week in the month of April. 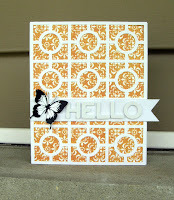 This week's card is a tone-on-tone "Hello" card and next week, a beautiful burlap flower card. Here is a link to this week's Miss Art's card tutorial for their OWH card drive! Last week's pop-up card was a freebie, but the rest of Miss Arts' classes are available for a reasonable subscription price. Be sure to look them up if you are interested! Doesn't that burlap flower look like fun? Now then, won't you take the opportunity this week to work on those pop-up cards and look forward to a fancy new tutorial next week. I'm taking a tutorial vacation of sorts this week while spending some Easter family time and I am waiting on some very exiting tutorials to share with you for the rest of the month. If that pop-up card just isn't for you, you CAN find a listing of past tutorials here sorted by degree of difficulty. The 101 tutorials are basic, while the 201 level tutorials cover more advanced techniques and tools, and the 301's are the most challenging or have the most steps. I've been trying to mix it up a bit so that there is a little something for everyone each month. Go, craft, and have fun. Also, if you have an idea or suggestion for a tutorial or you would like to submit a tutorial of your own, won't you please contact me? OWHtv: Episode 52 - Flu! OWH Make Em Laugh bloghop!